Starting this March, I have been a vegetarian for 10 years. 10 whole years. A decade, people. That’s a very large chunk of time. So while we spring forward, and capture an extra hour of end-of-day light, I will also be looking back for a few moments, to digest this anniversary of sorts. I turned to my best friend, Christina, my eyes the size of saucers and said “I’m never eating meat ever again”. And I never did. I think my mom and the rest of my family thought this was a “phase” when I first told them about my decision. I can picture my mom probably cocking an eyebrow, thinking internally that this would be over in a few weeks, at most. But here I am. These are in no particular order. I do not wish to go into the details of these reasons for risk of sounding preachy, but you can read more about them here and here. (On top of these three reasons, the thought of meat at this point also grosses me out. I would describe it to a meat-eater as the physical reaction he/she would have if asked to eat monkey brains). So, that’s how it happened, the spark that lit the fire. The reasons it continues to burn have changed with the winds- as I have become more conscious of our world, our environment, health and nutrition, and my pocketbook. Of all of these, becoming a vegetarian has most thoroughly shaken my perspective on health and nutrition. You can read a bit about my health transition, from eating mostly processed foods, to eating mostly processed vegetarian products, to adopting a whole-foods lifestyle, in this post. One turning point that I do not mention in that post was taking a nutrition course my senior year in college. It was in that class I learned the nitty-gritty details surrounding the purpose of each vitamin and mineral; I learned why fat is good (plant-based, fat, that is! ), the purpose of omega-3s, and the fact that having an optimal ratio of omega-6 to omega-3 fatty-acids can lead to decreased mortality (the ratio is 4:1 in case you are curious, and the typical Western diet is 16:1! Eek). I also learned the hard stats behind our country’s obesity and preventable disease problems (35% of our country is obese, guys! Even typing this number now utterly shocks me). We also delved into athletic nutrition, which really resonated with me, as I am a runner. We talked about the purpose of fuel before and after a workout, that muscles really need carbs to recover- not protein. My professor also nailed home the point that omnivorous Americans over-consume protein like no other.I would be more than happy to discuss any of these points in further blog posts, if any of you are interested. But, anyway. Back to this veggiversary, if you will. When I first started the veg lifestyle, I ate, yes, lots of processed foods as I mentioned earlier, but in addition, I also relied on more animal products: milk, cheese, eggs. I think this was because a) they were familiar, b) they were convenient, c) I was afraid of being protein-deficient and was not well-versed in plant protein. As the years have ticked by, I have relied less and less on animal products, to the point where I am now vegan about 75% of the time. That other 25%-ish of time where I do eat animal products is at breakfast a few days a week, where I have greek yogurt, and on the weekends, when I sometimes go out to brunch or dinner. My weekday lunches and dinners are usually vegan. Why this vegan-predominant lifestyle? It’s hard for me to answer. I guess I still don’t feel very comfortable eating milk / eggs / cheese when I know how inhumanely animals are treated in agro-business, and what a negative stamp raising livestock leaves on the environment. Regardless, I don’t think becoming vegan 100% is the right move for me right now. I’m comfortable in my current eating style: the mostly-vegan-but-yogurt-loving-vegetarian one. We’ll see where this journey takes me, as I continue to grow and learn; I welcome the future with an open heart and mind. I think that this is an exciting time to be a vegetarian. There is a growing cohort of health-conscious Americans, and companies are popping up to cater to every health need. Just take a step into Whole Foods, and take a peek at all of the vegetarian and vegan variety. There are a bunch of plant-based protein powders, dozens of grains and beans overflowing the bulk bins, 3 or 4 or 5 (!) different non-dairy yogurt brands, bags of every sea vegetable you can think of…the list goes on. I think (and hope) that this is just the tipping point, and that in years to come, being meat-free will be even more commonplace. More and more existing restaurants are starting to offer vegetarian and vegan options, and more and more new restaurants are being founded to serve this growing market. I am clenching my fists and squealing with excitement over how much potential there is. The future is bright and veggie-ful, indeed. Kale, yeah! 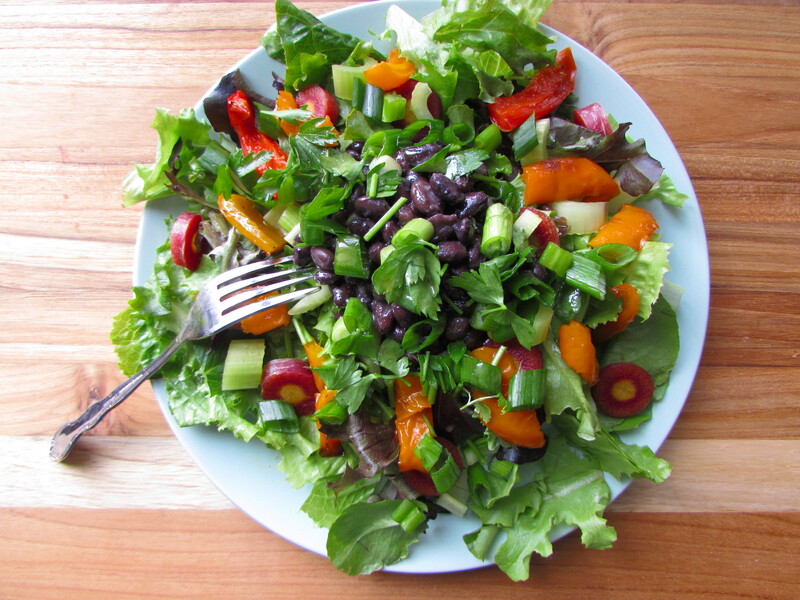 This salad I am sharing with you today is vibrant, energizing, and green. It is everything I am anticipating spring to be. A bed of romaine and spring mix is scattered with gorgeous rainbow carrot coins, celery, and roasted red pepper tendrils. 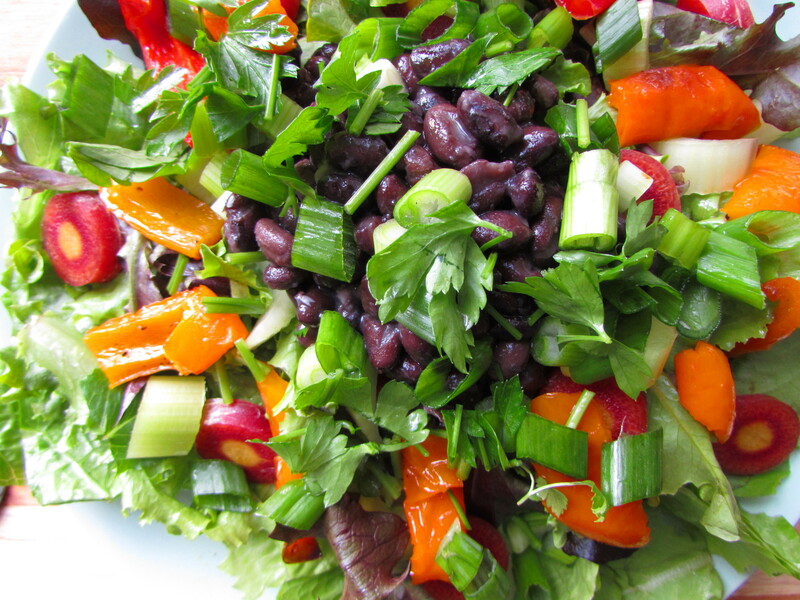 A nice mound of hearty black beans perches in the center, and bits of zingy parsley and spring onion waft over the top. The dressing is a lovely sunset hue, and consists of Trader Joe’s Orange Muscat Champagne Vinegar, pictured below, dijon mustard, and olive oil. Elegant and simple. Layer ingredients, in the order listed, onto a large plate or into a bowl. Toss with Orange-Muscat Vinaigrette, recipe below. In a small prep bowl, whisk the vinegar and dijon together until combined. Add the olive oil and stir vigorously until the dressing thickens. 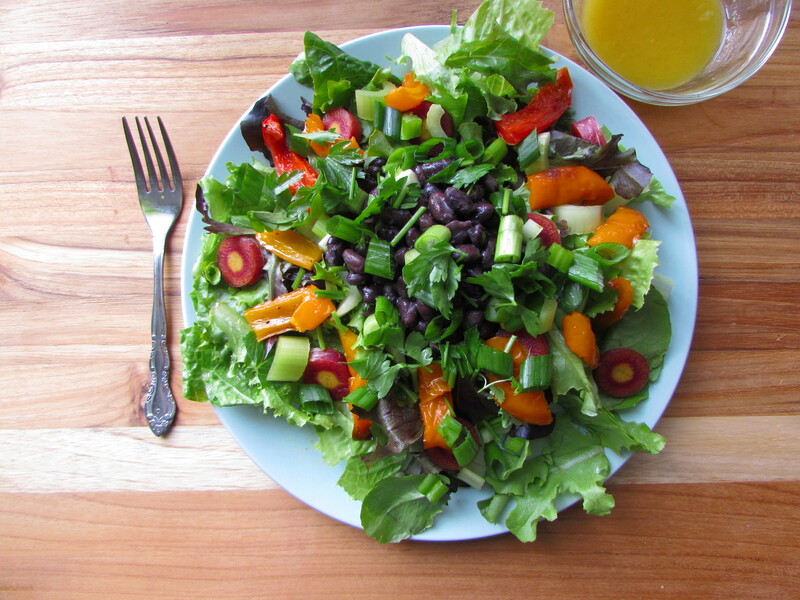 Pour over salad and chow down! Notes: 1) I roasted a red and orange bell pepper in some olive oil and salt and pepper for this salad. If you have jarred laying around, those should be fine, too. 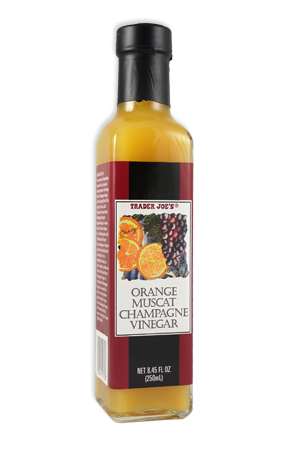 2) I found orange muscat champagne vinegar at Trader Joe’s. If you don’t have any, I think white vinegar or cider vinegar + a dash of orange juice would be a good sub.